To Cite: Yeon M R, Yoo J Y, Kim S J, Lee S J, Lee O. Thin-Walled Cavitary Lung Adenocarcinoma: A Rare Unusual Case, Iran J Radiol. 2018 ; 15(3):e60731. doi: 10.5812/iranjradiol.60731. Thin-walled cavitary lung adenocarcinoma is not common. When cavitary lung cancer was classified as a histologic subtype, squamous cell carcinoma was the most common, followed by adenocarcinoma and finally large cell carcinoma. Cavitation was not found in small cell lung cancer. Some cases of thin-walled cavitary lung adenocarcinoma have been reported. 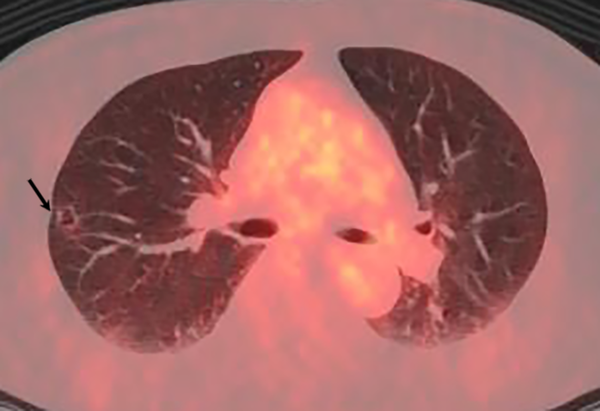 Thin-walled cavitary lung cancer can be detected by the following radiological signs: irregular thickening of the cavity wall, wall nodule formation, the presence of compartments in the cavity, increased standard uptake values (SUVs) on positron emission tomography (PET). A thin‑walled cavity accompanied by mediastinal lymph node or distant metastasis, or enlargement of the lesion on long term follow-up. We report on a case of thin walled cavitary lung cancer whose cavity tended to enlarge during a 10-month follow-up, but no other evidence of imaging finding indicated potential lung cancer. It suggests that the unidirectional check-valve mechanism could make enlarging thin walled cavitary lesion due to lepidic growth pattern. Cavitary lesion is a common radiological finding in a variety of infectious and noninfectious diseases. Most cavitary lung cancers generally present thick-walled cavities. Lung cancer, which appears as a solitary thin wall, occurs in 8% of all lung cancers (1). So diagnosis of thin-walled cavitary lung cancer is still a big challenge. Recently, however, reports of thin-walled cavitary lung cancer have been published (2, 3). In the case of cavitary lung cancer, most of the pathological types are squamous cell carcinoma, followed by adenocarcinoma and finally large cell carcinoma. There was no case of cavitation in small cell lung cancer (4). A few cases of thin-walled cavity lung adenocarcinoma have been reported. In a previous study, thin-walled cavitary adenocarcinoma tended to have predominant histologic features of lepidic growth pattern. A previous report revealed that approximately 80% of thin-walled cavitary adenocarcinomas were highly or moderately differentiated adenocarcinoma (2). And the image of the chest computed tomography showing a thin-walled cavity with uneven thickness of the wall, wall nodules, or compartments in the cavity, in addition to increased standard uptake values (SUVs) on positron emission tomography (PET); a thin‑walled cavity accompanied by mediastinal lymph node or distant metastasis; or enlargement of the cavity on long term follow up, showed potential lung cancer (4). A comparison of histologic and radiological findings revealed that thin-walled tumors showed more frequent ground glass opacity patterns at the periphery. Lepidic growth around the tumor is characteristic of the terminal respiratory unit type adenocarcinoma (2). In the previous study, stenosis occurred due to invasion of cancer cells to the bronchial wall, and the bronchus acted as a valve capturing excessive gas into the tumor, causing enlargement of the cavities (4). Therefore, we describe computed tomography (CT) and positron emission tomography (PET) findings of our thin-walled cavity adenocarcinoma, and correlate with check-valve mechanism. A 63-year-old man was referred to our hospital due to abnormal finding on a healthy examination of chest CT performed outside the hospital. He had no significant symptom. He was a former smoker (15 pack per year). All laboratory findings were within normal limits. Chest X-ray revealed clear lungs with a normal-sized heart. CT scan performed outside the hospital revealed a 7 mm sized cavitary nodule with a thin wall in the right upper lobe (Figures 1 and 2A). Figure 1. A 63-year-old previous smoker man with abnormal chest CT with no significant symptom. Initial low dose chest CT on a healthy examination revealed a 7 mm sized cavitary nodule with a thin wall in the right upper lobe. Figure 2. A, Initial low dose chest CT. B, On follow-up chest CT after 5 months, a cavitary nodule increased in size, 7 mm to 8 mm, and a more prominent change of cavitary shape with a thin and smooth wall. C, On follow-up CT after 10 months, it revealed more progression of the lesion, 9 mm sized, but the wall of the cavitary nodule still showed regular smooth thickness. A follow-up CT scan obtained 5 months later showed slight progression of the lesion. A cavitary nodule increased in size, 7 mm to 8 mm, and a more prominent change of cavitary shape with a thin and smooth wall (Figure 2B). A follow-up chest CT, 10 months later after the initial CT scan showed more progression of the lesion, 9 mm sized, but the wall of the cavitary nodule still showed regular smooth thickness, less than 2 mm (Figure 2C). So the patient was admitted to our hospital for investigation of a solitary thin-walled cavitary pulmonary nodule, increasing in size. Positron emission tomography revealed no significant uptake of the cavitary nodule (SUVmax = 0.7) (Figure 3), and no abnormal hypermetabolic lymph nodes (LN) in the mediastinum. Brain MRI revealed no abnormal enhancing lesions suggesting metastasis in the brain parenchyma or skull. Abdominal and pelvic CT, and liver MRI showed no evidence of intraabdominal metastasis. Figure 3. Positron emission tomography-computed tomography (PET-CT) image showed no significant uptake of the cavitary nodule (maximum standardized uptake value [SUVmax] = 0.7). The patient underwent a right upper lobectomy. Pathologic results showed well-differentiated adenocarcinoma, and tumors with lepidic growth and an invasive component was categorized to lepidic predominant adenocarcinoma (Figure 4). Figure 4. Microscopic findings; A, Adenocarcinoma can be observed in the lower part when compared with normal lung cells in the upper part. Tumors with lepidic growth and an invasive component were categorized into lepidic predominant adenocarcinoma (Hematoxylin-eosin stain, × 40); B, Tumor cells lining along the alveolar wall, which means lepidic growth pattern (Hematoxylin-eosin stain, × 200). Cavitation is a common occurrence in multiple thoracic disorders, including benign, infectious, and malignant conditions. So the diagnostic challenges remain with accurate detection of cavitary lung cancer. Moreover, thin-wall cavitary lung cancer has been reported in previous studies for a special form of lung cancer. The incidence of cavitation in primary lung cancer ranged from 2 to 16% (3). However, cavitation of lung cancer usually showed with wall thicknesses of > 4 mm. Thin-wall cavitary lung cancer is an infrequent type of lung cancer, which is rarely reported (4). In addition, in the case of thin-walled lung cancer, most of the pathological types are squamous carcinomas, followed by adenocarcinoma and finally large cell carcinoma. Cavitation was not found in small cell lung carcinoma (1). Several cases of thin-walled cavitary lung adenocarcinoma have been reported. 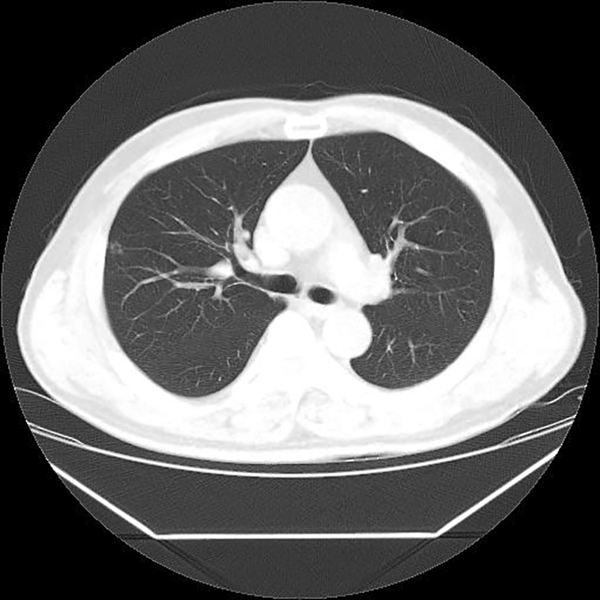 Radiologic findings of previous reported thin-walled cavitary lung adenocarcinoma provided some highly suspected signs: irregular thickening of the cavity wall, wall nodule formation, septum in cavity, increased standard uptake values (SUVs) on positron emission tomography (PET), a thin‑walled cavity accompanied by mediastinal lymph node or distant metastasis, or enlargement of the lesion on long term follow up (4, 5). All of the above features are considered to be potential clues for the diagnosis of thin-walled cavitary lung adenocarcinoma. Our case showed a 7 mm sized cavitary nodule on the initial CT with a thin, regular, and smooth wall, and the thickness of the wall was less than 2 mm. A follow-up CT scan obtained 5 months later showed slight progression of the lesion. A cavitary nodule increased in size, 7 mm to 8 mm, and more prominent change of cavitary shape with a thin and smooth wall was seen. A follow-up chest CT, 10 months later after initial CT scan showed more progression of the lesion to 9 mm size. However, the wall of the cavitary nodule still showed regular smooth thickness. In addition, positron emission tomography revealed no significant uptake in the cavitary nodule (SUVmax = 0.7), and no abnormal hypermetabolic lymph node in the mediastinum. As mentioned above, CT features of thin-walled cavity lung adenocarcinoma are as follows: uneven thickening of the cavity wall or wall nodules, an increase in the SUV, compartments in the cavity, a thin‑walled cavity accompanied by mediastinal lymph node, or distant organ metastasis. In our case, these findings suggesting malignancy on CT images were not clear. However, the size of lesions continued to increase and surgical biopsy was performed. Moreover, previous cases have been reported in which the initial lesion revealed a smooth thin wall, and as the lesions grew larger, the lesions got more irregular and the nodules changed (4). On the other hand, our case continuously showed a regular lesion with a smooth wall all through the 10-month follow-up. In the pathology evaluation of previous studies, thin-walled cavitary adenocarcinoma tended to have predominant histologic features of lepidic growth pattern. Pathological types of thin-walled cavitary lung cancer were moderately or well-differentiated adenocarcinoma. Although the exact pathogenesis of cavitary lung cancer is not well known, possible mechanisms have been reported to be ischemic necrosis due to occlusion of the feeding vessels within the tumor or the check-valve mechanism of the conducting bronchus. Because thin-walled cavitary adenocarcinoma appears to be related with lepidic growth, the tumorigenesis mechanisms of thin-walled and thick-walled adenocarcinomas are considered to be different (2). The check-valve mechanism mentions that cavitation is likely to be initiated by the development of carcinoma cells in the alveolar wall. These transformed cells then grow into the bronchi to form a unidirectional check valve due to the lack of cartilage in the bronchiole. Gas accumulates in the alveoli and ruptures and fuses into the cracked cavity. As internal pressure increases over time, the size of the cavity gradually increases (1). The high incidence of lepidic growth type in cavitary lung adenocarcinoma supports that thin-walled cavitation resulted in a unidirectional check valve mechanism that is directly related to the infiltration of tumor cells into the bronchi (1). This case demonstrates the check-valve mechanism in the development of cavitary lung adenocarcinoma, especially well-differentiated type lepidic growth adenocarcinoma. In conclusion, we presented the rare case of thin-walled cavitary lung adenocarcinoma without evidence of malignant feature on imaging studies such as uneven thickening of the cavity wall or wall nodules, an increase in the SUV, or compartments in the cavity, indicating potential lung cancer. Nonetheless, the cavity gradually grew in size, and it resulted in unidirectional check-valve mechanism due to lepidic growth pattern that caused enlargement of the thin and smooth walled cavitary lesion. 1. Xue XY, Liu YX, Wang KF, Zang XF, Sun JP, Zhang MY, et al. Computed tomography for the diagnosis of solitary thin-walled cavity lung cancer. Clin Respir J. 2015;9(4):392-8. doi: 10.1111/crj.12172. [PubMed: 24931383]. 2. Watanabe Y, Kusumoto M, Yoshida A, Shiraishi K, Suzuki K, Watanabe SI, et al. Cavity Wall Thickness in Solitary Cavitary Lung Adenocarcinomas Is a Prognostic Indicator. Ann Thorac Surg. 2016;102(6):1863-71. doi: 10.1016/j.athoracsur.2016.03.121. [PubMed: 27663793]. 3. Goto T, Maeshima A, Oyamada Y, Kato R. Cavitary lung cancer lined with normal bronchial epithelium and cancer cells. J Cancer. 2011;2:503-6. doi: 10.7150/jca.2.503. [PubMed: 21980325]. [PubMed Central: PMC3187935]. 4. Qi Y, Zhang Q, Huang Y, Wang D. Manifestations and pathological features of solitary thin-walled cavity lung cancer observed by CT and PET/CT imaging. Oncol Lett. 2014;8(1):285-90. doi: 10.3892/ol.2014.2065. [PubMed: 24959262]. [PubMed Central: PMC4063653]. 5. Xue X, Wang P, Xue Q, Wang N, Zhang L, Sun J, et al. Comparative study of solitary thin-walled cavity lung cancer with computed tomography and pathological findings. Lung Cancer. 2012;78(1):45-50. doi: 10.1016/j.lungcan.2012.06.004. [PubMed: 22784387].